Laid down by Bath Iron Works, Bath ME February 10 1955. Launched April 12 1956 and commissioned February 1 1957. Fate Broken up for scrap in 1993. 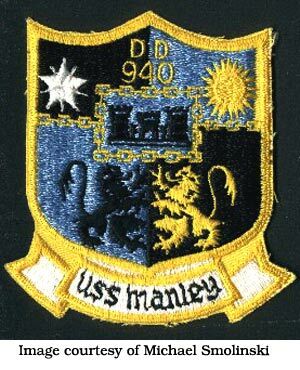 The third Manley (DD-940) was laid down 10 February 1955 by the Bath Iron Works Corp., Bath, Maine; launched 12 April 1956; sponsored by Mrs. Arleigh A. Burke, wife of the Chief of Naval Operations; and commissioned at the Boston Naval Shipyard 1 February 1957, Comdr. William H. Rowan in command. The Manley a Forrest-Sherman Class destroyer was the last of the "Big Guns" destroyers. It had a huge engineering plant that made it one of the fastest destroyers in its day. Manley departed Newport, R.I., 11 April for shakedown in the Caribbean. On 7 June Manley got underway from San Juan, P.R., on a good will cruise that took her to Lisbon; Amsterdam; Kiel, Germany; and Copenhagen. She returned to the Boston Naval Shipyard 12 July tor repairs and alterations. Manley departed Boston 22 August 1957 and sortied from Norfolk 3 September 1957 with an attack carrier strike force headed for the large scale NATO Fleet exercise "Strike Back." She arrived in Firth of Clyde, Scotland, 14 September and put to sea on the 17th in the screen of a carrier force conducting simulated battle practice and war tactics as it steamed off the coast of Norway and north of the Arctic Circle. She returned to Southampton on 30 September and reached Norfolk 24 October, escorting submarine Jallao (SS-368). She was assigned to DesDiv 41 and became the flagship of DesRon 4. On 4 December 1957 Manley left Norfolk with Gearing (DD-710), Robert H. McCard (DD-822) and Vogelgesang (DD-862), bound for a tour with the 6th Fleet in the Mediterranean. She practiced simulated antisubmarine warfare attacks with the ships while en route. She was diverted 11 December through heavy seas toward the Azores, where an aircraft had been reported down. At 0400, 12 December she was hit by a tremendous wave Two of her men were killed and several injured as a large portion of the galley, radio, and radar rooms were stove in and flooded. Enduring northwesterly gusts up to 80 knots, she battled through rain squalls and mountainous seas toward Portugal and reached Lisbon at night 13 December for emergency repairs and hospital treatment for her injured. She moved to Gibraltar on the 18th. Manley underwent voyage repairs in the Royal Dockyard of Gibraltar until 4 January 1958, then headed via Bermuda for Norfolk where she arrived on the 15th. The destroyer entered Philadelphia Naval Shipyard 22 January where repairs were completed by 29 April 1968. She returned to Norfolk and resumed her role as the flagship of DesRon 4. On 6 June 1958 she sailed with her squadron for a combined Atlantic Fleet operation that included midshipmen training, visits to foreign ports, and implementation of the President's people-to-people program. Manley reached Kiel, Germany, 25 June 1958; arrived Copenhagen 10 July; departed on the 16th, escorting carrier Lake Champlain to Antwerp, Belgium, and returned to Norfolk 2 October. She cleared that base 3 November with Intrepid (CVA-11) to Join the 2d Fleet in maneuvers off San Juan. She returned escorting Franklin D. Roosevelt (CVA-42) during operations up the eastern seaboard to the Virginia Capes. The first half of 1959 saw Manley at Key West, Fla., with the Surface Antisubmarine Development Detachment; for overhaul at Norfolk Naval Shipyard; and for exercises at Guantanamo Bay, Cuba. On 1 March DesRon 4's home port was changed from Norfolk to Charleston, s.c.; Manley first entered her new base 25 July. The squadron sailed 21 September for the Mediterranean and a 6th Fleet deployment that included antisubmarine exercises off Crete with British forces, air defense exercise "Long Haul" and ASW exercise "Boomerang" with French ships. Manley got underway from Naples on 6 February 1960 for exercise "Big Deal II" with a task force built around aircraft carriers Saratoga and Essex. She departed Rota, Spain, 31 March and reached Charleston 10 April 1960 for overhaul. She departed her home port 21 July for bombardment firing exercises off Culebra Island and on the 27th proceeded to station No. 5 on the Atlantic missile range for the test firing of a Mercury space capsule. However, on this occasion the missile malfunctioned and was destroyed off the Florida coast. Manley returned to Charleston 1 August 1960 and departed 6 September for Wales. She reached Cardiff, Wales, 3 October and sailed a week later conducting experimental antisubmarine warfare patrols and attack team exercises en route home, arriving Charleston 20 October 1960. Following operations along the coast and an overhaul, she operated off of Jacksonville, Fla, then sailed 8 March 1961 for Pollensa Bay, Mallorca, in the Mediterranean. She touched there 19 March, then joined Forrestal (CVA-59) at Beruit, Lebanon for fleet maneuvers. Manley left Rota, Spain, 23 September and reached Charleston 5 October. After exercises along the Florida coast, she proceeded from Charleston to the troubled waters of the Dominican Republic. In company with two other destroyers, she rendezvoused with Franklin D. Roosevelt 22 November to become a part of task force patrolling waters south of Hispanola. The presence of Manley and other units of the task force did much to stabilize a situation which had threatened to plunge the country into bitter fighting to return an unpopular dictatorship. Manley returned to Charleston on 27 November. She entered Charleston Naval Shipyard in April for overhaul; and, on 28 September, she headed for Guantanamo Bay and refresher training there she rescued a downed helicopter pilot from shark infested waters. In Cuban waters at the beginning of the Cuban missile crisis she spent most of October and November patrolling the waters near Guantanamo Bay, a part of the mighty naval force which persuaded the Soviet Union to withdraw its offensive missiles from the island. While returning home the destroyer rescued the three men of yacht Avian, adrift in the Atlantic. Late in January 1963, Manley sailed to the Caribbean for operation "Springboard 1963." After ASW maneuvers with Essex (CVS-9), joint Canadian American ASW exercises took her to Halifax, Nova Scotia, in the summer. In October Manley departed Charleston for the Mediterranean. During this deployment the commander of the 6th Fleet made the destroyer his flagship during a 3-day visit to Tunis. In December she transited the Suez Canal for duty under commander, Middle East Force helping to ease tension in that vital part of the world. On 13 January 1964 she evacuated 91 American citizens from revolution-torn Zanzibar. She continued to patrol this troubled area until returning to Charleston early in March 1964. 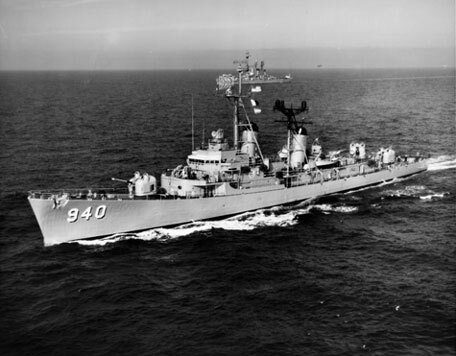 The hard working destroyer got underway from Charleston for the Mediterranean 6 January 1965 and represented the United States during celebration of the 10th anniversary of CENTO in Iskenderum, Turkey 26 February. On the homeward voyage, during the midwatch 7 May, an alert Manley lookout spotted the collision of Kaskaskia (AO-27) and Liberian tanker SS World Bond near the island of St. Helena. Manley sped to aid the stricken tanker, rescued 23 passengers, and fought fires and flooding in a successful effort to save World Bond. She reached Charleston 7 June. On 9 August Manley sailed for a recovery station for the space flight of Gemini V. After Lake Champlain recovered the capsule, Manley headed for the Canary Islands en route home, and arrived Charleston 11 September. She operated along the Atlantic coast and in the Caribbean for the next year preparing for combat duty in Southeast Asia. The destroyer departed Charleston 5 October 1966, joined DesRon 20 at Guantanamo Bay, transited the Panama Canal, and set course for Hawaii. The squadron reached Pearl Harbor on the 25th and 6 days later pushed on to Japan arriving Yokosuka 10 November. On the 14th she sailed via Buckner Bay for Vietnam. En route, on 17 November, she assisted the seriously ill captain of the Greek merchant ship, Marcetta. On 21 November Manley relieved Hull (DD-945) in Da Nang as a unit of TU 70.8.9, a gunfire support group of the 7th Fleet. Manley provided extensive and valuable support fire until on 7 December, a powder case ignited in the breech of one of her guns before being fully rammed. The resulting fire and explosion set the mount afire and endangered the magazines. Prompt and skillful damage control stuffed out the blaze before more damage occurred. The casualties were evacuated by helicopter after being treated on board, and the destroyer steamed to Da Nang to disembark Senator Henry M. Jackson of Washington who was visiting the ship when the accident occurred. After repairs at Subic Bay, Manley got underway 19 December and joined Enterprise (CVAN-65) and Bainbridge (DLGN-25) in the Gulf of Tonkin. She operated with these ships until assigned to TG 77.4 on the 30th for ASW work with Bennington (CVS-20). Early in 1967 she resumed gunfire support duty and continued her outstanding efforts to help repel Communist aggression in Southeast Asia until relieved 22 March. She then headed home through the Straits of Molucca, the Indian Ocean, the Suez Canal, and the Straits of Gibraltar, arriving at Charleston 9 May. Her stay at home was short, however, for Manley departed Charleston again on 29 September. Sailing via the Panama Canal, Pearl Harbor, and Guam she once again took up station off of South Vietnam Again concentrating her efforts on naval gunfire support, she completed her tour and sailed back to the east coast and Charleston, arriving 10 June. With a brief voyage to the North Sea area in fall 1988, Manley continued operations out of her homeport until stricken from Navy ships records on June 1, 1990. In 1993 she was scrapped. She is only a memory for all who had the great pleasure of serving onboard one of the fastest destroyers in Destroyer Squadron Four.